A mix of color to brighten the garden including rich shades of tomato red, near-fluorescent orange, magenta, golden yellow, and white on 22-30" stems from midsummer into fall. Z 4-9. A native echinacea with slightly drooping, rose-purple petals and large, coppery-orange central core. Long summer bloom period. 2-3' ht. Z 3-8. 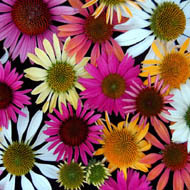 Compact form of native echinacea with clear pink, downward curved petals and large, bronzy-orange central cone. Very floriferous. 18" ht. Z 3-8. Large flower heads with rose-pink ray petals and coppery-brown core. 30-36" ht. Z 3-8. 1998 PPA Perennial Plant of the Year. Upright clump with sturdy stems holding flowers with pure white petals and yellow center beginnning in mid-summer into the fall. More compact than 'White Swan'. 16-21" ht by 12-16" w. Z 3-8. Upright clump with sturdy stems holding flowers with intense rose petals surrounding a rose center beginnning in mid-summer into the fall. More compact than 'Magnus'. 16-21" ht by 12-16" w. Z 3-8. Like 'Magnus', petals are horizontal, not drooping, but are a deeper rose-red color. 30-36" ht. Z 3-8. White flowers with coppery cone. 30-36" ht. Z 3-8. Heart-shaped leaflets tinged with red in spring and fall. Rich ruby-red flowers during midspring. 8-12" ht. Z 5-8.